The code starts with a leading 1 to identify the length of the code, and thus the depth in the tree. After that, the code is made up of a series of 3-bit tuples that indicate a high or low value on the binary split of the x, y, and z dimensions respectively. Using a 32-bit integer, this can represent 10 levels of depth in the tree. 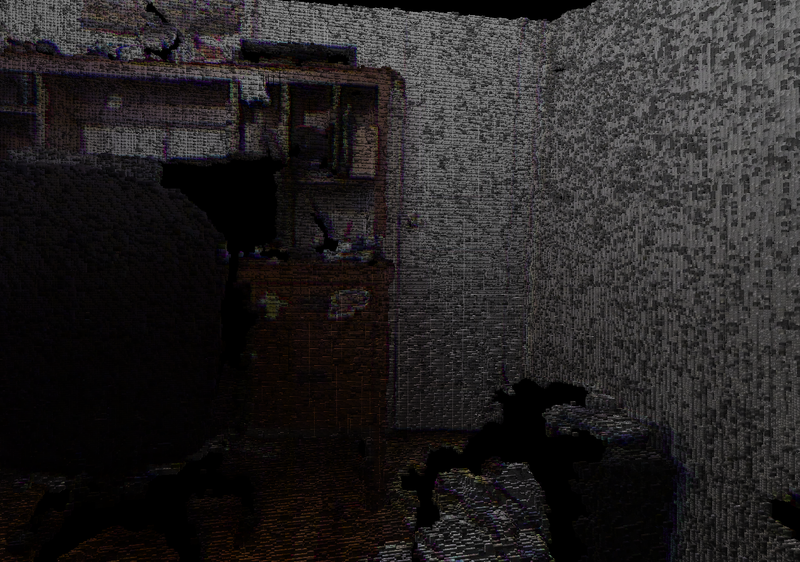 However, this is insufficient for mapping with a Kinect camera. The Kinect has a range of 1-10 meters in depth resolution, and doing a back of the envelope calculation for the horizontal resolution (480 pixels, 5m range, 43 degree field of view) shows that the camera will typically provide sub-centimeter resolution. A 10 meter edge volume can only achieve 1 cm resolution using 10 levels of depth. Therefore, I have transitioned to representing these keys with long integers (64-bit), which could represent more than kilometers of volume at millimeter precision, if needed. Here is a look at the enhanced resolution that can now be achieved. The first is an older image using ~2.5 cm resolution, and the second is enhanced to 4 mm resolution. 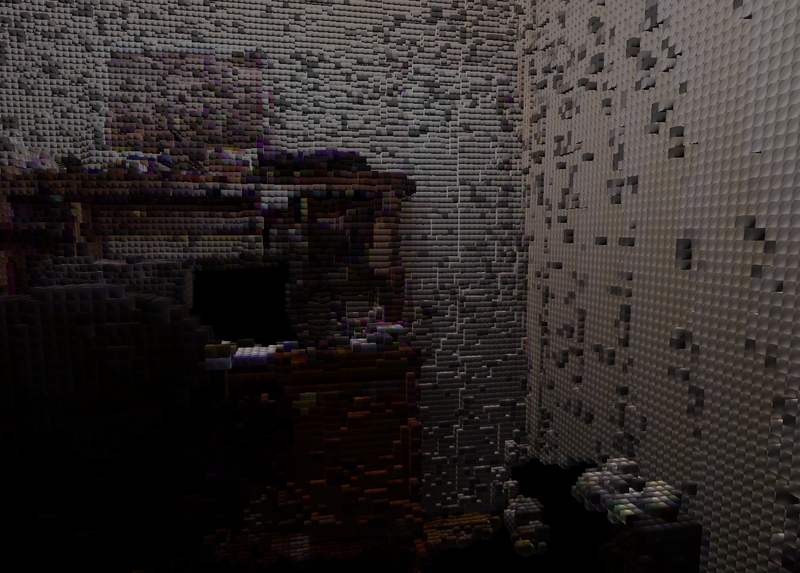 This level of detail adequately captures the data provided by the Kinect camera. Another modification that I made to use of these keys is the ordering of the 3-bit tuples. Originally, I found it very useful to represent the octree keys using the most significant tuple on the farthest to the right. The value was that the octree is almost always traversed starting from the root node. The child node from the root could be obtained using the key by performing a bitwise-AND with 0x7. For the next depth, the key could be modified with a shift right by 3 bits and repeating the same process. Max depth of the key is reached when the remaining code is 1. However, several parts of my algorithms involve getting unique keys from a list, truncated at different levels of depth. Starting with the least significant tuple makes truncation change the ordering of the keys. This means that every call to "unique" must be preceded by a call to "sort." Together, these make up the slowest part of the octree update process. The most straightforward way to improve this was to remove the need to sort repeatedly by switching the order of the tuples. While this is less convenient for octree traversal, I've found it to result in a worthwhile performance gain. Now, getting the most significant tuple from the key involves finding the position of the leading 1, then extracting the following 3 bits. Updating the key for the next depth requires subtracting the leading 1, along with these 3 bits, then adding the leading 1 at 3 bits to the right of its previous location. Although this is messier, the complexity can easily be encapsulated by a function. The process of traversing the octree to update inner nodes following changes to leaves uses this unique-key paradigm. It starts with a set of keys identifying the updated leaves. Each pass reduces the depth of the keys by a level, and updates the nodes at this higher level from updated child values. However, at higher levels of the tree, the originally unique nodes start to overlap to the same nodes. We benefit from periodically reducing to unique keys, and prefer not to re-sort each time. I've found that for an identical scene and resolution, this process could be reduced from 14-17 ms to 10-12 ms.